No, I didn’t see another bear but we do have some not-so-“wild” life around our house. Or rather living under our deck and shrubs. We have rabbits, squirrels, chipmunks, a ground-hog, and mice surrounding our house. And I really hope they stay outside. Deer and turkeys run through our yard. 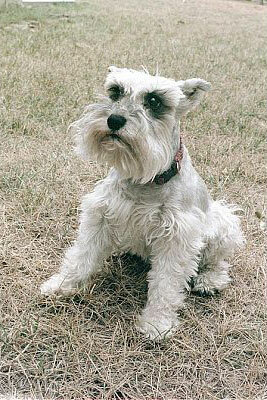 Gabby was our miniature Schnauzer. (BTW miniature Schnauzers are the perfect dogs for handknit sweaters.) She defended our property as though she were 10 times her size and kept the wild and not-so-wild life away from the house. She’s been gone since 2001 and the wildlife finally figured it out. Then we weighed the pros and cons. A dog and all the associated responsibilities just won’t fit into our lifestyle right now. I loved the picture of Gabby. I can’t believe she has been gone for 10 years. Yes, I imagine another dog would be hard to .fit into your life style now.